Lafayette County was organized November 16, 1820, from part of Cooper County. The county lies on the south side of the Missouri River and is the second county from the western border of the state. It is approximately thirty-three miles in length and about eighteen miles in breadth and has a river front of about forty miles. The county seat is Lexington which is situated on a high bluff overlooking the Missouri River about twelve miles from the western boundary of the county. Prior to the Civil War, Lafayette County was principally engaged in hemp production. Waverly and Lexington both had rope manufacturers or rope walks as they were known. Large quantities of the unfinished product were shipped east in large bales. These were stored along the river front in huge warehouses to await shipment by steamboat. The Civil War changed all this. The rope walks and warehouses had been burnt by Kansas troops and jayhawkers in a retaliatory raid against Confederate Calvary General Jo Shelby for his part in the burning of Lawrence, Kansas. Also hemp was a labor intensive crop as was the process of turning it into rope, so with the Emancipation Proclamation the main source of manual labor was lost. So Lafayette County agriculture in 1866 was considerably changed. There were still some that raised hemp but the domestic market was drying up. During the war when all hemp production had come to a halt, demand had not. This had been satisfied by non- U.S. sources that still had cheap or virtual slave labor such as the Philippines or South America. They could produce hemp and rope much cheaper than was possible in the states. In 1866 the people of Lafayette County were trying to find a replacement for hemp, in tobacco they hoped to find this. The yields were not as large as hoped for due to the fact that most people attempting to raise it were inexperienced in its management. Also considerable quantities were lost or injured in the fall due to excessive rains and early frost. In spite of all the problems the quantity shipped to market from Lafayette County was large and of an excellent quality or so they stated. Corn was raised but very little of it shipped with most of it being grown for personal use; the same was true of wheat, oats and sugar cane- the yields were large but very little was planted. Orchards were seen everywhere with apples being in large quantity these would bring from sixty cents to a dollar a bushel. At this time laborers were earning from seventy-five cents to a dollar and a half a day so the fruit business was increasing in extent and numbers rapidly. Coal was abundant in every part of the county and was of high quality. A considerable amount was mined above Lexington in the river bluffs and shipped east by steamboat. In 1866 there was no railroad in Lafayette County. However the Missouri Valley railway was being built and was expected to connect Lexington to all railways east and west within a year. By 1870 the hemp market had rallied a little bit with the going price for hemp in 1870 at one hundred and thirty-five dollars per ton. However production was still dwindling because of labor costs and a lack of knowledgeable farm labor for hire. It can be reasoned that tobacco had not replaced hemp as the main cash crop, since there is no cash price on record for tobacco sold out of Lafayette County in 1870. However wheat was selling for eighty cents a bushel, oats forty cents a bushel, barley one dollar a bushel, fat cattle at this time were selling for three to four cents per pound, and fat hogs at seven to eight cents per pound. In 1872 improved land in Lafayette County was selling for an average of twenty dollars per acre while unimproved ground brought an average of twelve dollars an acre. Timber was reported as being overly abundant with timberlands being worth twenty dollars an acre and bottom lands about the same as they were usually covered in heavy timber. The1872 livestock census reported that there were 9,038 horses in the county valued at $352,665, mules and asses totaled 3,409 for a value of $146,770, there were 19,645 cattle worth $232,190, there were 9,029 head of sheep valued at $9,730, and 55,795 hogs worth $88,250. The census also reported that the real estate of the county was valued at $5,364,325 and that the citizens were divided about the need for a stock law. 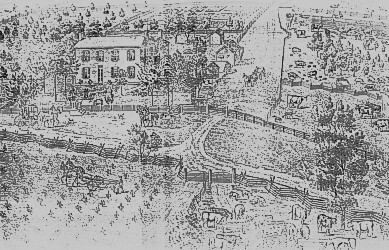 There were two nurseries in operation one in Lexington and one in Aullville these supplied the seed stock for the growing number of orchards which were highly successful it is reported that S.H. Vernangle, of Waverly cleared $4,500 from his fruit in 1872.